Tovino just gets better with every film! And somehow, without me noticing, he has crafted a distinctive onscreen persona that is completely original to himself. Big and beefy and attractive, but also kind of dim and childish and naive. And, the best skill of all, an actor who is able to support and efface himself in order to let his heroine shine. Godha to Mayanadhi to this film, it is the female performance that will get you talking on the way out, that will lead to bigger and better things. But it is only because Tovino is such a stellar scene partner that the female role can be so spectacular. In this case, his female co-actor is Urvashi, who I am sure I have seen in things before this but I can’t remember them. She was an award winning actress as a young woman, went on to be a writer, director, and lead even as a middle-aged woman, the age when most actresses are put out to pasture. But in the past few years, I am seeing smaller and smaller parts on her filmography, a character’s mother with no name of her own, in one case just “beautician”. I am so glad she gets to be a real lead in this movie! Urvashi and Tovino easily dominate the film, but it’s a movie with a solid supporting cast as well. Mamukkoya as the fatherly friend, Hareesh Kanaran as the best friend, Shanthi Krishna shining in a small role. The rest of the film beyond the acting is excellent as well, lovely setting, pleasant songs (especially the opening song, just beautiful), it all comes together to make a smooth and well-constructed film experience. The only flaw is the plot. There are some gaps that feel like they should be filled in, and some dangling threads that don’t make sense, and even a few straight up problems and conflicts in the plot that just don’t work. The overall sweep of the story works and makes sense, but the little details just aren’t cutting it. But then, I don’t watch films for plot first and foremost. I watch them for the emotions, and this film perfectly captures the emotions of the characters and the growth of their relationship. 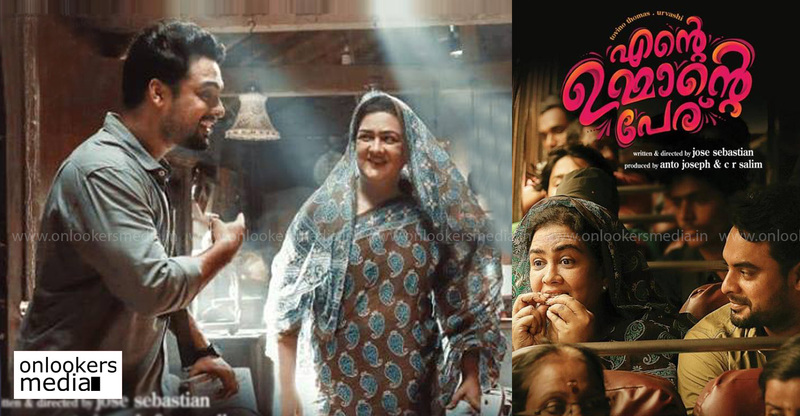 Tovino’s sweetly childish version of manhood, and Urvashi’s brusk and confident version of womanhood are a perfect complement. And did I mention that Tovino looks really good? He hasn’t lost the muscles from Godha, I can tell you that much. He is a sweet manly hunk of muscles and cute smiles and shy hand flutters. If you are a Tovino fan (you know who you are), this movie is like a lovely little gift, just for you. This entry was posted in Monday Malayalam and tagged Ente Ummante Peru, Kerala, Malayalam, Monday Malayalam, Tovino Thomas, Urvashi by mredlich21. Bookmark the permalink. I haven’t seen this film. Urvashi is the best actress ever in malayalam cinema and probably in Indian cinema too.Her comic timing, versatility and natural acting are unmatchable.. her sister Kalpana was another brilliant actor and one of the finest comedians in malayalam cinema. You have seen Kalpana in charlie and Bangalore days( Nivins mom)..
Once this film hits streaming, you should seek it out if only for Urvashi’s performance, she starts out unpleasant and never really softens, but makes the audience sympathize with her nayway as time goes on. Don’t think urvashi has directed any movies.she has worked in all South Indian languages since the age of 13,kamalhasan considers her as one of the best actresses ever and she has like 5 Kerala state awards and a national award in her kitty. Thalayanamanthram is a classic.amongst her recent works achuvinte amma. She is considered to be the most versatile actress and can handle comedy better than the heroes. You’re right, I was mistaken, she wrote and produced films but hasn’t directed. She was wonderful in this, tempting me to go on a little mini-Urvashi film spree. Yes.shobana ,urvashi and revathy were the holy trio of late 80s and 90s.It helped that Malayalam had family centric movies unlike the typical hero oriented movies in other languages so these ladies has as much to do or even more than the heroes. Like a devasuram which started the trend of macho mohanlal movies had a revathy who was real gutsy. Shobhana in manichithrathazhu ,innale, thenmavin kombathu ,pakshe ,urvashi in mithunam, ponmuttayidunna tharavu,bharatham,kalipattam,mazhavil kavadi,malooty and of course thalayina manthram, revathy in kilukkam, devasuram ,kakothikavile appopanthadikal though I love her in mayamayooram a movie which reminds me a lil bit of innale . She gets more of a hero treatment in this movie than Tovino does, big intro, cool nickname, gets to be triumphant and solve problems and have hidden skills, all kinds of things. While Tovino just sort of lazes around and is soft and passive. I hope I will be able to watch this movie someday. Tovino’s movies always take ages to be available , if ever. I’m still waiting for Abhiyum Anuvum (May) and Maradona (July) and Theevandi (September). I was going to watch Ente Ummante Peru too, but thanks to “He is a sweet manly hunk of muscles and cute smiles and shy hand flutters” this movie is much higher on my priority list now. It was a nice surprise for me too! I thought I would have to miss it, and then snowstorms and movie timings made it possible. It is a lovely movie, well worth seeking out, and Tovino gets better and better with every film. Oh, and this is Angie! Your name didn’t show up, so it took me a second to identify by email. Yes, you will absolutely love this movie. He is very sweet and kind of dumb and just follows people around looking big eyed and confused and with muscles on muscles in a nice healthy cuddly way. Oh you’re right I forgot to write my name. Haven’t watched this movie yet but I love Tovino – just wanted to put it out there! 🙂 I watched Godha again the other day and without him the movie just wouldn’t have worked. Urvashi – I just love her, she was amazing in the 80s and 90s. I loved her in movies with Jayaram because they shared a great sense for comedy and she’d easily outshine her male coactors-. Loved her in Bharatham as well – as the supporting fiance. It was a Mohanlal show but she’s such a good actress that she was just as indispensable. If you love Tovino and Urvashi, this movie is for you. They both have wonderful roles and wonderful performances. I wouldn’t have thought to put their two energies together, but it is kind of perfect to have this very funny and abrasive older woman with this very sweet and kind of dumb young man. Urvasi is hands down the most versatile actress Malayalam ever had. The kind of heroine who stands par with the hero and makes us realize movie belongs to both of them. Tovino, while I like his movies a lot has a bit mor of fine tuning in his acting to do. Ente Ummante Peru is on Prime, but not only US one but italian too!!!!!! Yaaaay!!!!! I am so happy for you! And I can’t wait to hear what you think.